The saw shark which was successfully pulled to shore. PULAU BRUIT, Daro: Two fishermen from Kampung Bruit here were in for a huge surprise on Monday night when their fishing trawler net seemed heavier than usual. Little did they know that what they had hauled up would create history as their catch was none other than a saw shark weighing close to 300kg. Pulling with all their might, the fishermen (name withheld) had to call for help from friends in the village as their catch was extremely heavy and considered the biggest fish they had caught throughout their years as fishermen. 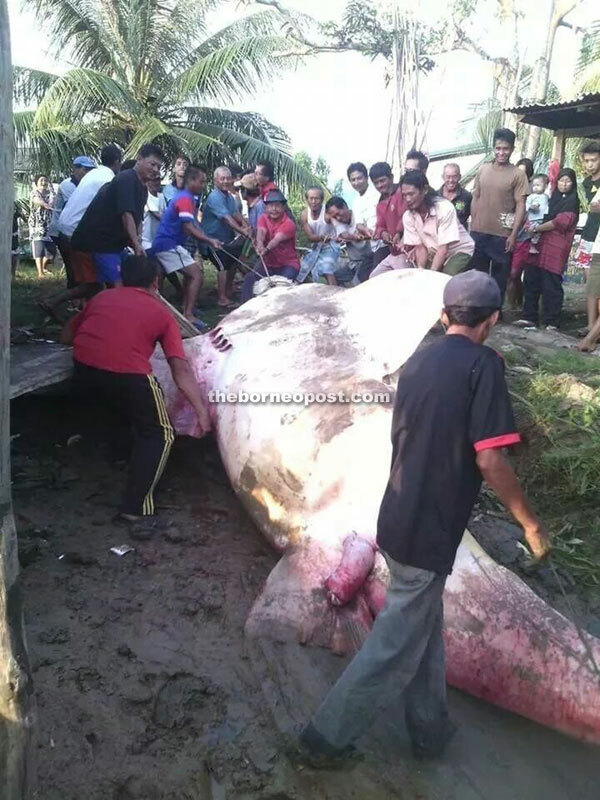 Villagers measuring the length of the saw shark after it was pulled to shore. 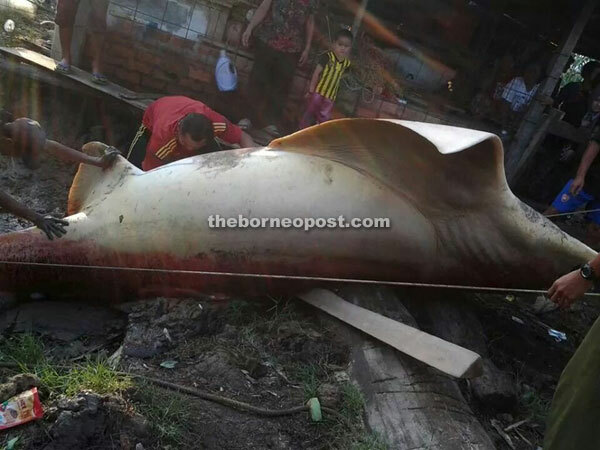 Initially, the 27-year-olds were not aware of what fish they had caught at sea near Pulau Bruit around 9pm but after dragging the fishing net to shore with the assistance of other fishermen, they were shocked to find that they had caught a saw shark measuring five metres long and two metres wide. “We took almost 30 minutes to defeat the saw shark but we were unable to haul it up to the boat as it was too big and heavy. Our only option was to tow it back to Kampung Bruit jetty and wait for sunrise before dragging it to shore,” one of the fishermen recalled of his experience. By then, many villagers had thronged the beach to see for themselves the unusual catch of the day. 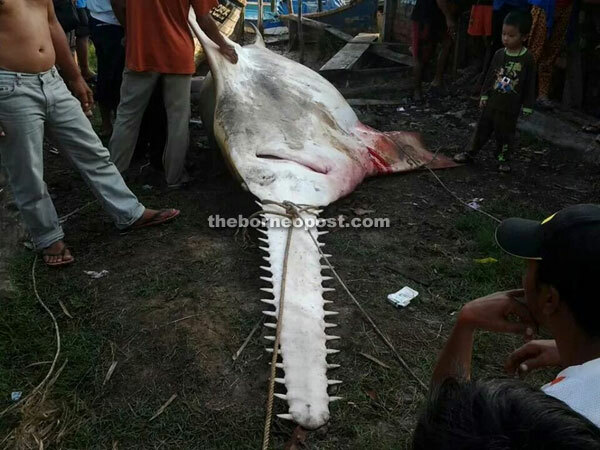 The saw shark has since been sold to villagers and interested customers in Sibu. Details on proceeds of sale were not disclosed. Meanwhile, photographs and stories of the large catch went viral on social media amongst residents of Pulau Bruit as many commented that they had never seen such a huge fish caught by fishermen before. According to Wikipedia, the saw shark is an endangered species. However at press time, Sarawak Forestry Corporation could not be reached for comment.